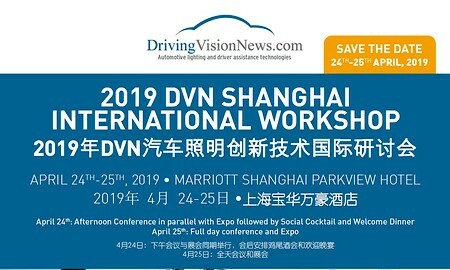 The next DVN Workshop will take place in Shanghai on April 24th - 25th, 2019, at the Marriott Shanghai Parkview Hotel, during the Shanghai Auto show. Exceptional contributors from OEMs and suppliers are expected to highlight the recent trends in automotive lighting. In addition, the 27 exhibition booths will host fruitful exchanges between all attendees. We are looking forward to our participation and an exciting event in Shanghai.